Action Collabs help groups discover innovative fixes to practical problems and create real value for educators and learners. 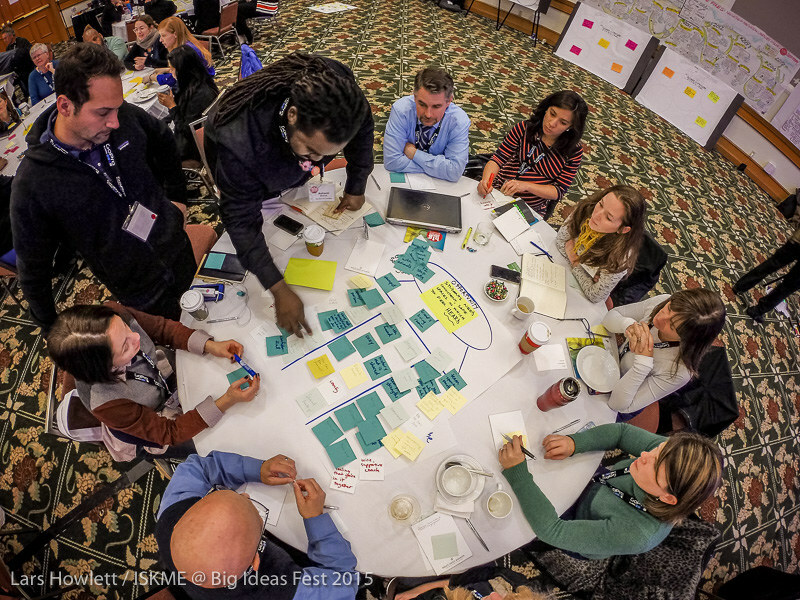 ISKME’s Action Collab framework is a collaborative approach to problem-solving that combines human-centered design thinking concepts with improvisation techniques to unlock a group’s creativity and capacity for innovation. Develop fresh perspectives to reframe familiar challenges. Identify unexpected solution possibilities that open up new directions. Spark strategic thinking that reveals new partnerships and relationships. Identify Opportunity: groups use empathy based listening and observing tools, and immersion activities to gain inspiration and insight from users. Design: No solution is out of bounds as groups stretch their imagination to answer a focusing “How might we?” question drawing from their deeper understanding of user experience. Prototype: Groups select a specific solution idea and show how it might work by creating physical prototypes, role-play scenarios, and user narratives. Impact: In order to create impact, groups share their solutions with users to get meaningful feedback. Action Collabs can be modified and tailored to meet the needs of any group charged with developing new solutions or strategies focused on creating tangible improvement in people’s experiences. The Action Collab Framework creates a safe space for open and collaborative thinking and provocation, in which participants give each other permission to experiment with ideas and explore possibilities. ISKME works with individuals and groups to develop their capacity for designing and leading Action Collabs in their own organization. Public Training: ISKME offers two-day training sessions open to the public, in which participants experience an Action Collab and then look under the hood to explore the rationale of each step in the process. Participants discuss the goals for each Action Collab module, learn the activities that support those goals and the improvisation techniques that enhance the group’s collaboration. Time is dedicated for participants to practice giving process instructions and facilitate activities with rich de-brief and reflection on learning. “I learned how provocation is the land where innovation lives and how critical it is to get a group there. This includes the power of improv to bring about the innovation and provocation mind-set.” Action Collab training participant. Organizations that ould benefit from custom trainings include those that have a particular goal for their training, such as: a team charged with leading redesign efforts or new business development; or creating a multi-year initiative targeting innovation and transformation. often benefit from custom training workshops. ISKME can design a series of Action Collab sessions and trainings so that participants learn how to design and lead their own Action Collabs. A series of sessions could include experiencing an Action Collab focused on a current design challenge, then participating in a two-day training to dissect and learn the AC process, then co-facilitation with the client organization to provide first-hand experience and feedback, followed by online support.